This year, for the first time, a hummingbird sipped nectar from the feeder outside our kitchen window all year long. It was, of course, an Anna’s. The rufous hummers have returned too. Such abundance! These hardy 3 gram hummingbirds have the longest migratory journey of the world’s 300+ species of hummingbirds - close to 6000 kilometres from Mexico and Central America. Now they're here, delighting us with their beauty and speed and remarkable ability to fly backwards, upside down, and hover in place like tiny magical helicopters. The territorial squabbling to stake out their place at the feeders, like impatient planes waiting to land at a busy airport, is in full swing. Luckily, they rarely damage their bills in these territorial battles because their instincts tell them to protect them. Once in a while someone asks me if it wouldn’t be better to let hummingbirds – or any birds, for that matter - get their food naturally, from native flowers and plants. 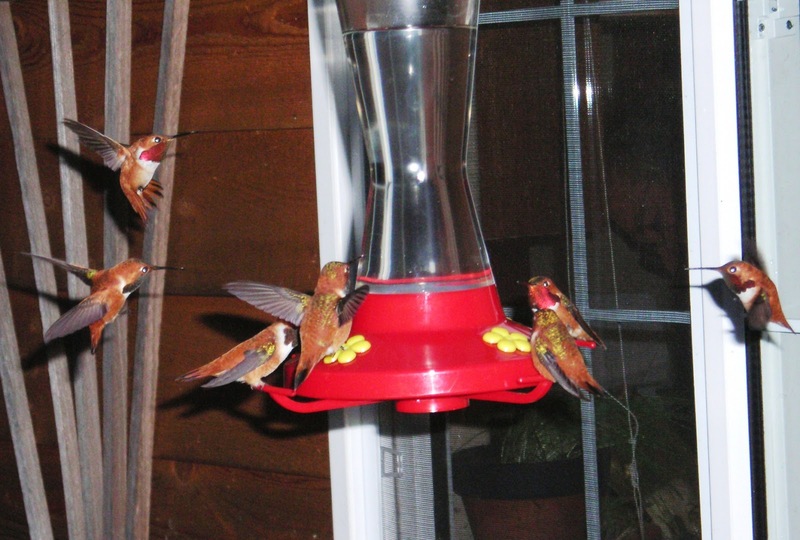 In an undeveloped world, yes, I think it would be better; the hummers would not need artificial feeders to help them refuel after their gruelling migratory journey. But that's not the planet they inhabit. Given all the deforestation and pollution and other acts of violence against the earth humans have already committed, providing supplementary nectar is, in my opinion, the LEAST we can do. 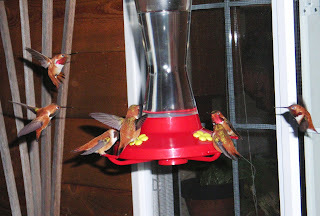 The value of human-supplied nectar lies not only in its ready availability but also in its efficiency for the hummers. In a 2011 Dartmouth University study researchers confirmed that hummingbirds (unlike humans!) feed according to Optimal Foraging Theory. Basically, this means that their intent is to balance the energy spent finding food with its caloric benefit in order to maximize their chances of survival. (In human terms, they wouldn't bother eating sticky buns because the nutritive value isn't worth the time and energy spent to ingest then digest them.) Since the flowers from which hummers eat produce just enough nectar to allow them to be pollinated, the tiny birds have to expend energy flying from flower to flower to find sufficient nectar. Given their high metabolism and energy requirements, there is a point at which a cost-benefit analysis says 'this just ain't worth it'. That's why hummingbirds aim to choose the largest flower patches with the 'sweetest' nectar concentrations. This is a Red-tailed Hawk at Ithaca NY on her nest - LIVE. Over a thousand people were watching this morning as one of the eggs started 'pipping'. Now just waiting for the first egg to hatch!! Thanks to the Cornell Lab. Come to the Nanaimo City Council meeting tomorrow - help protect 66 species of birds! And if you can make it, PLEASE join me at the Council Meeting tomorrow at 4 pm at the Vancouver Island Conference Centre. Join us for Birds on the Beach! It all started with a dead mallard that Dennis and I found on Brickyard and 'processed' as part of our monthly Beached Bird Survey for Bird Studies Canada. Part of the 'processing' involves putting a numbered metal tag on the carcass. But days later an observant beachwalker came across the tagged duck lying on the shore and wondered who had put the tag there - and why. (Was something sinister going on?) She called GROWLS. One conversation led to another until the mystery was finally solved. No foul play, after all! Just the opposite really - a citizen science program in action here on Gabriola. GROWLS then asked me if I would come and tell them about the Beached Bird Survey. 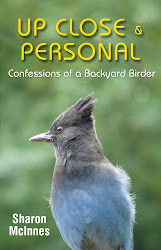 I could, I said, but the person you really want is Karen Barry of Bird Studies Canada. 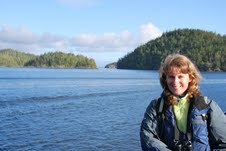 Karen, who lives in Nanaimo and is an avid birder, coordinates the Beached Bird Survey and the BC Coastal Waterbird Survey, helps coordinate the BC Important Bird Area program, and is knowledgeable about Project Feederwatch and eBird. At GROWLS' request, I invited her, and she kindly agreed to come to Gabriola to show us slides and talk about these important citizen science programs. Please join us for Karen's presentation on Wednesday April 17 at 1:00 at the Rollo Centre. (No charge. Donations welcomed.) And please help spread the word - in person, by email, by phone, or on your FaceBook page. For more info leave a comment below or email growls@shaw.ca. Hope to see you there!